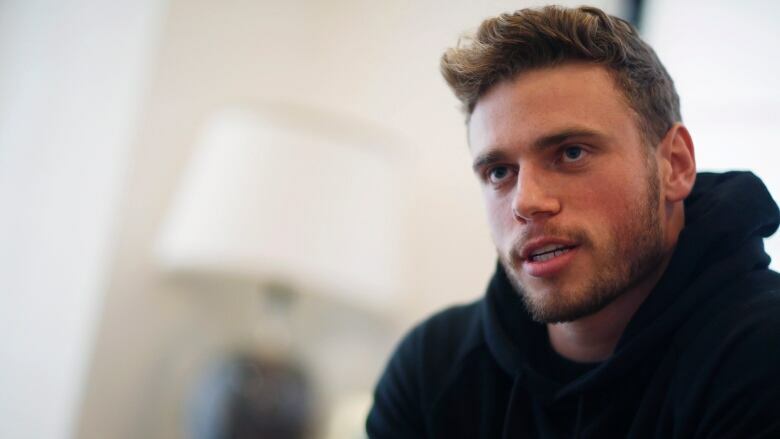 Sochi Olympic silver medallist Gus Kenworthy came out in interviews with ESPN and the Associated Press on Thursday, revealing to the public that he is gay. When Gus Kenworthy would let his mind wander into how his perfect Olympics might play out, he pictured a certain scene. He'd land his best tricks on his final run, win a medal and then — the capper — jump into the stands, ski boots and all, to share a big hug and kiss with the man who meant so much to him. "That would've been an amazing way to come out," said Kenworthy, the freestyle skier who won the silver medal in Sochi. But the timing, to say nothing of the country, wasn't quite right to tell the world he was gay. And so Kenworthy left Russia in February 2014 known best as the compassionate daredevil who adopted several stray dogs he came across in the mountains — and as the man who was part of an historic U.S. sweep of the first Olympic ski slopestyle contest. "I felt like I was already being so courageous with my body and my actions and the things I was doing in order to try to win and be the best," Kenworthy said at his home in Denver. "Then, I was being such a coward in this other way, where I wouldn't let anyone know. So they were battling each other. I'm excited where those two things can go hand in hand." Growing up in a mountain town with about 2,000 residents and only 50 kids in the school gives a boy who knows he's gay few places to hide. He threw himself into skiing to show he was every bit as tough and brave as anyone else. But there was no denying he felt conflicted. He spoke of severe depression, thoughts of suicide, the internal battle of how to "live authentically and not feel like I need to hide anymore." Heading into the biggest ski contest of his life, he wasn't all the way there. He hadn't told his parents, or his brothers. And though he had let himself get caught up in the idea of a celebratory kiss with his boyfriend, he knew it couldn't happen. "The idea of kissing my boyfriend at the bottom of my run would've been, in addition to me coming out, a silent f—- you to the anti-gay legislature in place in Russia," he said. Truth was the person who did most of the hard work with the dogs — including staying behind in Russia for more than a month to get them back to the United States — was his boyfriend at the time. "He got zero credit and I was getting asked about it on every show and in every interview," Kenworthy said. Much as the label "Dog Guy" stuck with him long after Sochi, Kenworthy is aware he could be cast, too simply, as the "Gay Skier." He said he likes the idea of coming out while he's at the top of his game, while people in his sport — especially kids — are paying attention. "I don't know what the future has in store," Kenworthy said, "but I'm kind of looking forward to it."